Whether you’re building a house from the ground up or considering a major remodel, adding a fireplace is always a fantastic idea. It provides a gorgeous focal point for any room, and it has the added benefit of keeping you warm and cozy in the cold winter months. If you’re unsure whether to choose a gas or woodburning fireplace, the information below about the cost and efficiency of each can help. The first thing to consider when comparing gas vs. woodburning fireplace is the initial cost of installation. Keep in mind that much of the cost associated with installing a fireplace is the labor. A gas fireplace is pre-assembled for the most part, which significantly reduces the amount of time and effort that goes into the installation. A woodburning fireplace, on the other hand, must be assembled on site – and that includes the expensive masonry, too. Simply put, a brick woodburning fireplace will cost between $5500 to $10,000, and the labor and installation can cost another $2500 to $10,000. The total cost ranges from $8000 to $20,000. A gas fireplace costs $1500 to $3000 for the materials, gas line hookups can cost anywhere from $150 to $800 (depending on whether there is an existing line), an exhaust pipe will cost $500 to $1000, and installation can cost $1500 to $3000. The total cost of a gas fireplace, then, ranges from $3650 to $7800 – usually far less than woodburning. When considering the cost associated with gas and woodburning fireplaces, it’s also important to think of the long-term costs associated with fuel. A woodburning fireplace will need seasoned wood or wood that has been left to properly dry in a kiln or other dry location. For a home that is roughly 2000 square feet, homeowners say they go through roughly four cords of wood each year in a single fireplace. Each cord will cost $200 to $600 depending on your location. Gas prices vary a great deal depending on the region. In Illinois, natural gas costs about 72 to 90 cents per therm, which means you will have an overall cost of as much as 29 cents per hours for a 32,000 BTU gas fireplace. 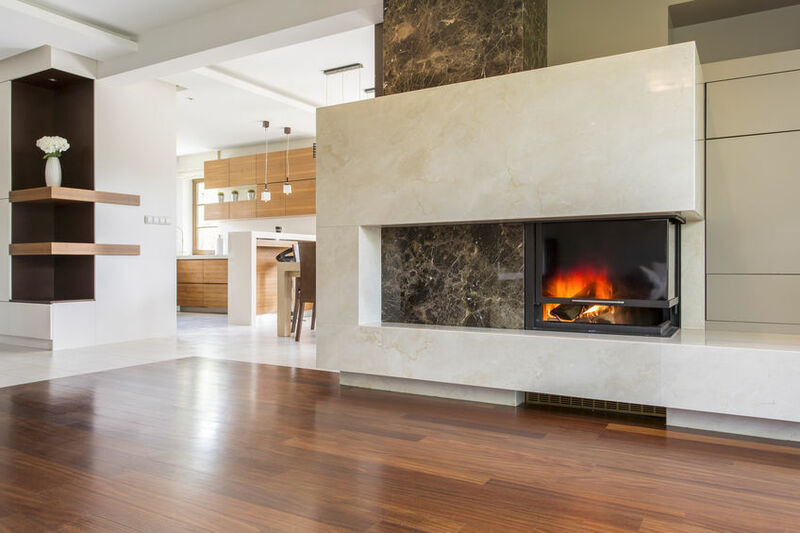 Finally, now that you have a solid understanding of the costs associated with installing and using gas vs. woodburning fireplaces, it’s important to also consider efficiency. In other words, which option will provide the most heat for the least energy? A standard woodburning fireplace with open masonry is surprisingly inefficient; some data suggest that it can be as low as 10%. However, ceiling fans, proper damper positioning, and good insulation can improve this efficiency a great deal. Gas fireplaces, on the other hand, offer far more efficiency. A single-pipe vent fireplace is about 50% efficient while a double-pipe vent model can give you up to 70% efficiency. If you buy a newer energy-efficient model with a direct vent, that efficiency can climb as high as 90%. In either case, it is important to insulate your home and reduce drafts to help keep energy costs down. When comparing gas vs. woodburning fireplaces, it’s clear that gas fireplaces are the least expensive and most efficient of the two. However, if ambiance is important to you – and it is to many homeowners in the DC and Montgomery County area – there is absolutely nothing like a traditional masonry fireplace to provide it.